I had just begun third grade when I bought this SUPER-FRIENDS treasury edition. And it represented a bit of a leap on my part. 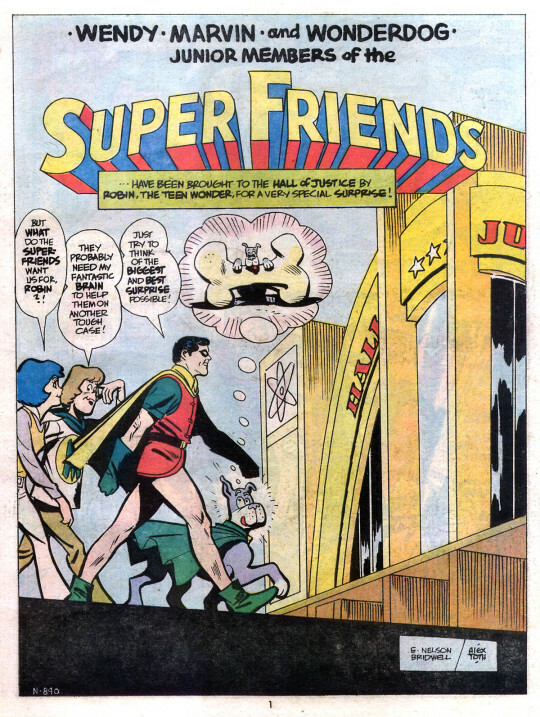 As much as I watched it every Saturday morning, I felt that Super-Friends was more kiddie than the regular comics I’d been reading, and thus somehow beneath my level as a sophisticated child of 8. Buying JUSTICE LEAGUE was respectable, buying SUPER-FRIENDS marked one as juvenile. Hey, this strange disguised self-loathing is something that almost all comic book fans go through at some point. The book opens with a new framing sequence written by DC’s keeper-of-history E. Nelson Bridwell and illustrated by Alex Toth, the genius cartoonist who was also doing storyboards on the animated series. Toth’s cartoony, stripped-down work wasn’t for everybody, particularly among the young–it looked too overtly simple. 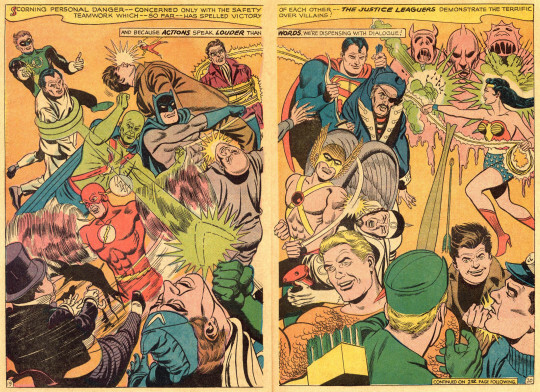 Seemingly agreeing, the Powers-That-Be at DC swapped in a Curt Swan head on Superman’s shoulders on the cover. This despite the fact that more people were being exposed to Toth’s version of Superman on Saturday mornings than would ever read this book. But the real reason I took the plunge and purchased this Special (or, actually, had it purchased for me) was that the guts of the book featured a pair of reprinted Justice League stories. In the first, when Green Arrow mysteriously quits the Justice League, his teammates all attempt to work out why by disguising themselves as the Masked Archer. One by one they battle their own foes in the guise of the expert marksman, and one by one they are defeated, and then are transformed into the likenesses of their foes and jailed. It’s the work of the League’s old foe Doctor Destiny, but it’s foiled by the real Green Arrow. Along the way, the entire League takes on their assembled foes in a big double-spread that was particularly effective at Treasury edition size. 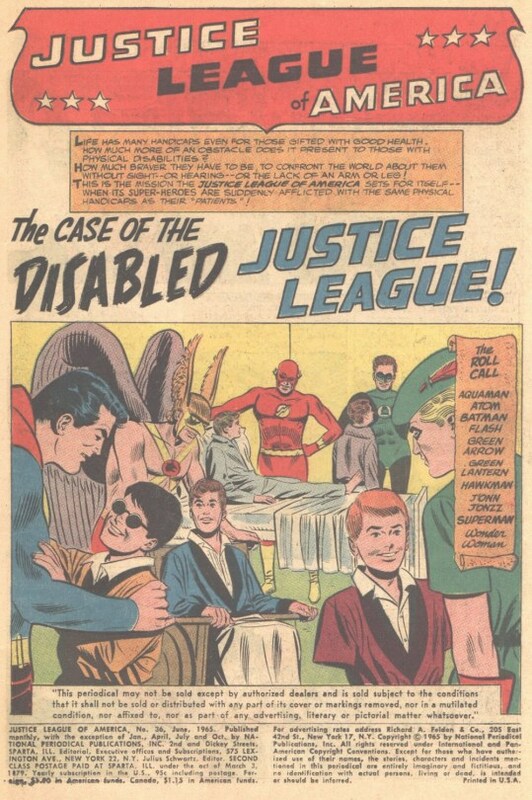 A second classic story follows more Super-Friends shenanigans, as the League comes together to inspire a group of disabled youngsters. They arrange a staged battle with Batman who has been transformed into a creature for the performance, but in succession each Leaguer is himself afflicted with a handicap that parallels one of the kids they’ve been showing off for. 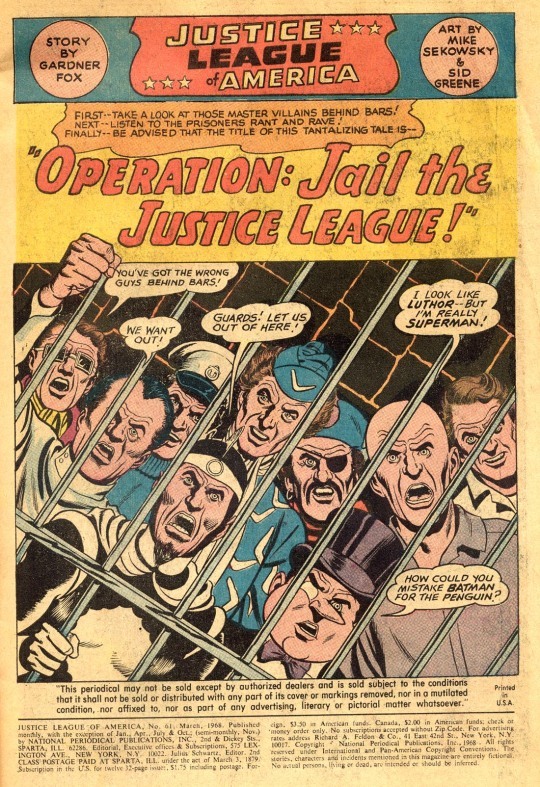 It’s the work of the League’s nemesis Brain-Storm, who has also broken his brother Fred out of jail. Despite their new limitations, the afflicted League members defeat Brain-Storm and are restored. But the villain still has a card to play. He uses his stellar helmet to transform the Leaguers first into duplicates of himself, and then into duplicates of each other. 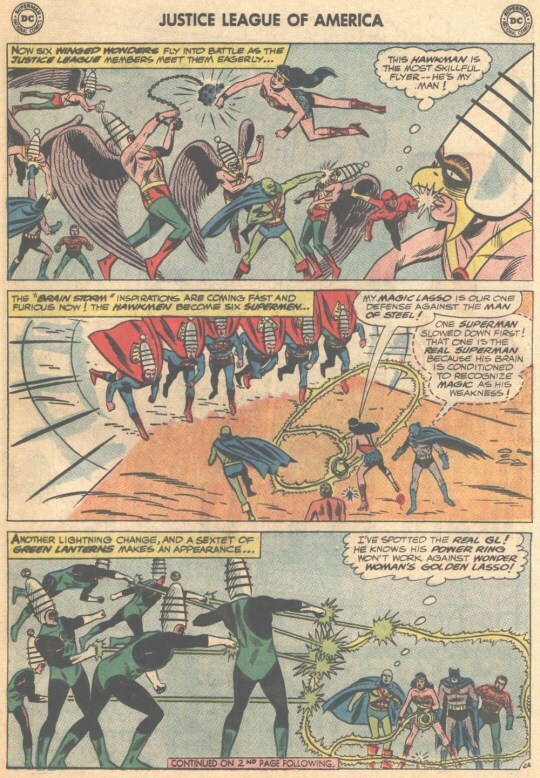 Batman leads the rest of the team against these duplicate villains, doping out which one is the genuine Brain-Storm so that they can subdue him and rescue their colleagues. And then events segue back to the Hall of Justice for a brief wrap-up with the Super-Friends and their young friends and ubiquitous dog. 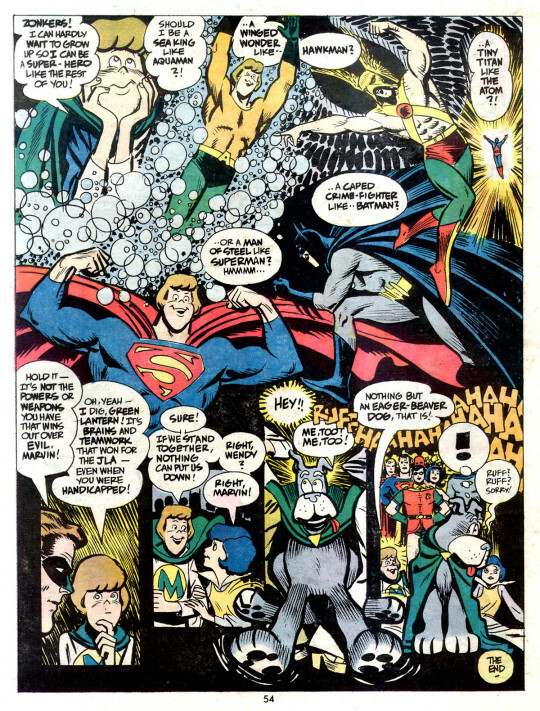 Bridwell packed the framing sequence with all sorts of lore about the JLA–he certainly didn’t see any difference between the “legitimate” comic book Justice League and its Super-Friends counterpart, as he’d prove later on when he wrote the SUPER-FRIENDS tie-in comic book series. Finally, Toth himself closes out the Treasury with a ten-page text-heavy behind-the-scenes feature on how animated cartoons such as Super-Friends are made. 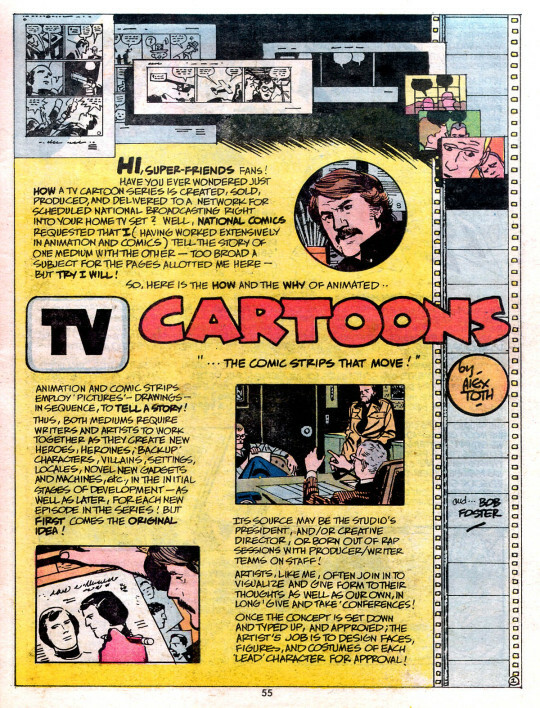 This section is chock-a-block packed with essential information for would-be cartoonists and animators, but I found it difficult to digest and get through–partially a product of my age, and partially due to Toth’s sometimes difficult-to-parse prose.